Sometimes a recipe comes along in a cookbook and you think, ‘this is perfect!’ I found this recipe while browsing through Paleo cookbooks and turned right to it. What I love is that it’s all in one pot and you can literally put (or omit) everything and anything you want in there including cheese. Once I finally got around to making this recipe, I immediately sent it to my mom and sister and told them to make it stat! My sister is a full-time working mom of two sweet boys, so I thought this might help make her life easier. And I have to say, even though I stay home with the girls, having two of them has definitely made me rethink all my cooking/baking that I do. Now I’m into finding what’s quickest while still being healthy (and Paleo) for the four of us. I will continue cook from scratch (with a few pre-made items occasionally) but now I look at the ingredient list first and see if they are ‘just too many’ ingredients involved…ain’t nobody got time for that. I had vaguely heard of crock pot liners, but now I see the draw for them. Ya’ll can guess that I’m not really a disposable girl, but this meal stuck pretty well to the pot, so next time I will pop in one of these liners. This recipe makes my life a lot easier in that I can pack Josh’s breakfast for several days all from one meal (I am that girl that packs his breakfast and lunch every day). Go ahead, gather all your ingredients to this make on a lazy Sunday afternoon (what’s that?!) so you are ready for the upcoming week. 1. 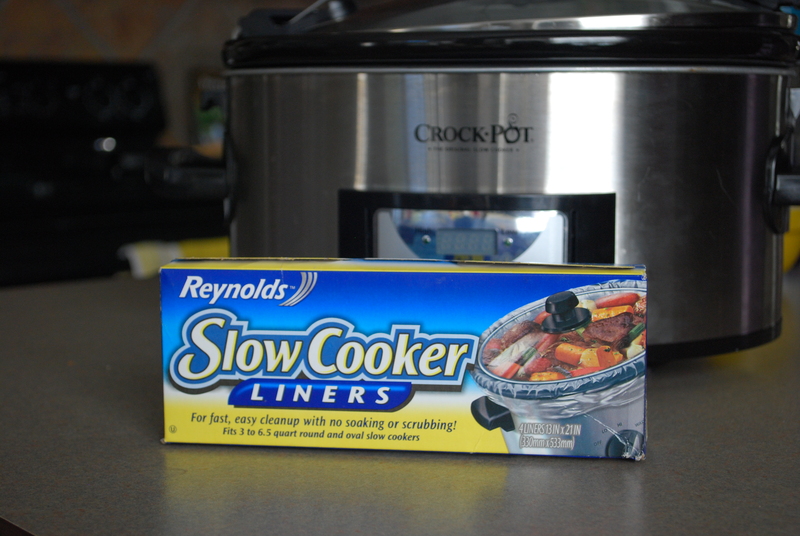 Line your slow cooker with parchment paper (or slow cooker liners). 2. Peel the sweet potato, and shred it using your food processor’s shred attachment. Spread the shredded sweet potato evenly over the bottom of the slow cooker. 3. Cut the bacon strips into smaller bite-sized chunks, and cook them in a skillet on medium heat until browned. If you are using pre-cooked bacon, crumble it into small pieces. Sprinkle the bacon evenly over the sweet potato. 4. With the casing removed from the sausage, crumble it into a skillet, and cook thoroughly over medium heat. Spread the cooked sausage over the bacon and sweet potato. 5. 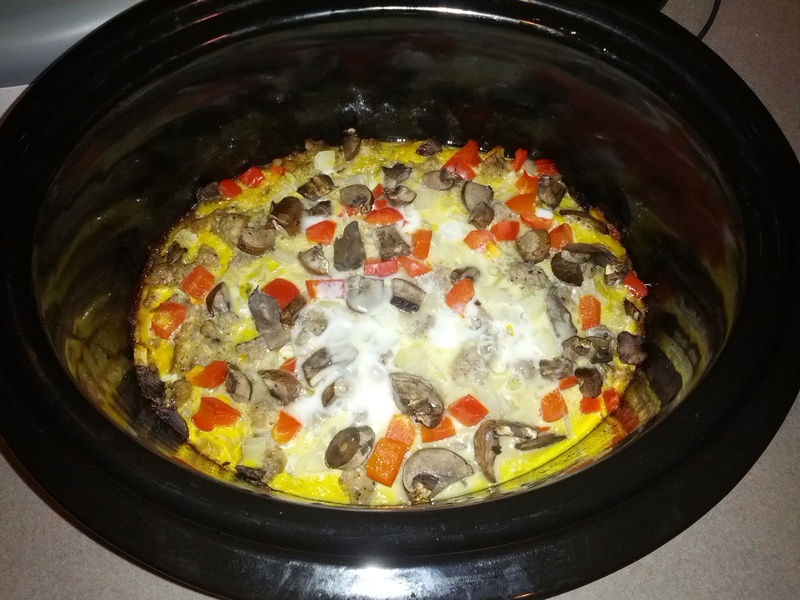 Evenly spread the mushrooms, onion, and bell pepper on top of the sausage in the slow cooker. 6. Beat the eggs together (add salt and pepper) until smooth, and pour them evenly over the mixture in the slow cooker. 7. Cover, and cook on low for two hours. To avoid over-cooking, remove the mixture immediately by carefully lifting the parchment paper out of the slow cooker. I tried this last night/this morning for work for bosses day. Wonderful! I just used a bit of spray on it and it was fine. But I also put a pound of sausage down first, then the sweet potato, then the egg mixture with peppers, mushroom and onion. It was wonderful and a big hit at work! I had to put it on high for a little while to get it done quicker, and it still worked. Super yummy!